This setup should be standard - allows one to remove most of the electronics easily. All my other guitars have everything hidden beneath a big pick guard, under the strings. Maybe a Les Paul is required here, then I can get to the back of the pots. This guitar allows me to play around with tone capacitors and treble bleeds without having to remove strings, fifteen screws, unsoldering the output jack, and such fun. In and out in minutes. Here is the inside of the "module". That coloured capacitor was the tone capacitor. 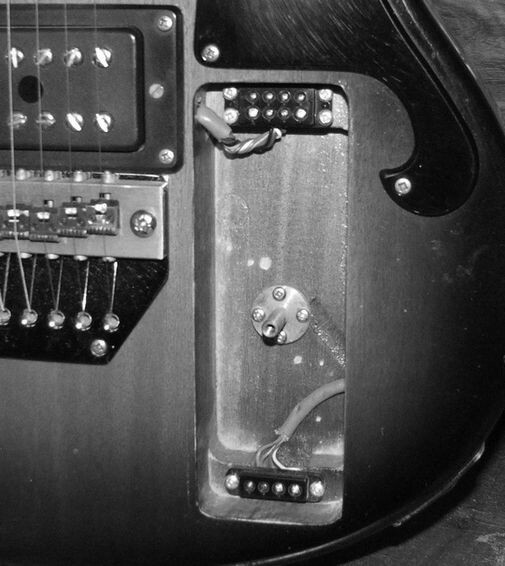 It shows the guitar's age, and resulted in much googling to find the value as .047 microFarad. To my surprise, the log taper potentiometers are 100K. Would the "standard" 500K make any difference? And the two potentiometers are not the same number, both 100K LOG, but different numbers. I spent hours salvaging capacitors and resistors from old junk, before finally junking it. I replaced the tone capacitor with this .015 microFarad (? It does not follow the numbering system of 153, and is too large to be picoFarad?) Guitar is much brighter now. 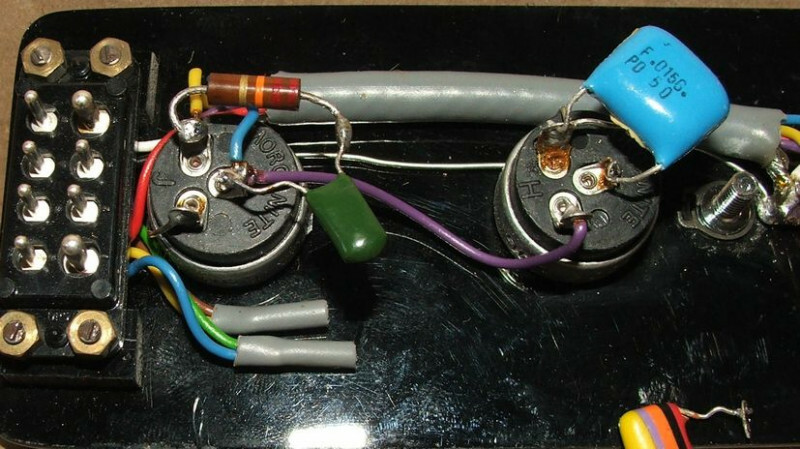 The treble bleed circuit is the "Kinman" style, a 2 nanoFarad capacitor with a 22 K resistor. I find the "Fender" style to have better volume spread at low settings, and cannot really say which style has the better volume taper. I have tried a 1 nanoFarad capacitor with a 100K resistor in series as here, as well as those in parallel, with a 10K resistor in series to that. If I had a bigger variety of components, I could play around some more, to fine-tune values and setup. At least this gives me a rough idea of what happens. Now, to upgrade to one volume pot, two tone pots. But, the CTS style pots have a bigger diameter, and might not fit in quite so easily. Your input as to whether 500K pots will be better, and favoured tone capacitor and treble bleed style and component values for humbuckers please? Since these were for both bass and guitar, I guess they didn't bother with marking the pickups with a value. If I were to guess, the one's on my old bass were 10k+, fairly hot for the time. They are great pickups. I expect the guitar would get brighter as you upped the values of the pots. Maybe start at 250 and see how bright you want it? I have on hand this handy item too: Bought back then, almost never used, due to the three way switch being broken (as bought or just shortly afterwards? Cannot remember) and if I did use it a few times, it would have been with only one pickup going through. I looked at it, there are enough tabs on the switch to allow me to jump/re-locate wires, losing the "stereo" output. I am not planning on using it anyway. From what I understand (from wiring diagrams on the net), the rhythm/solo switch bypasses the tone pots in "solo", giving the amp all you can. Which is not much with 100 K log volume pots. I measured the humbuckers' DC resistance. 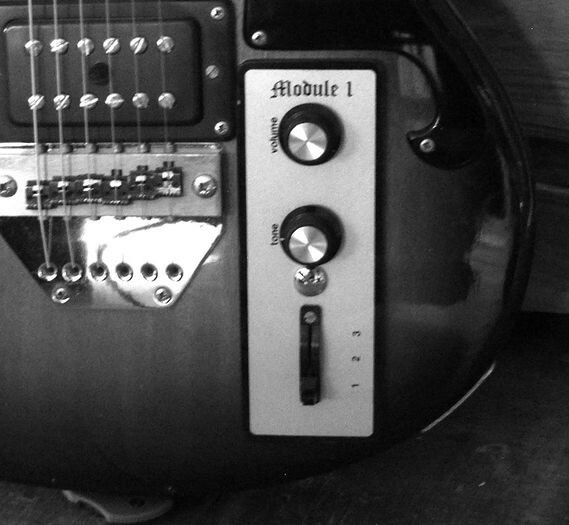 They are coil-tapped, but on these two modules, used as a full humbucker only. But, the possibility for splitting them various ways exist, not that I am up to sorting out that wiring jumble soon. Five way switch? Neck: 6.1 K and 6.2 K, total 12.3 K? Bridge: 3.97 K and 4.4 K , total 8.4 K? Not quite low values, although they sound like it. Time to swop out the potentiometers for 250 K or 500 K and more signal to the amplifier. If that theory holds up, I have been playing at 1/4 volume and less all these years. I at long last ordered some 500K Log pots, maybe CTS, but the number on the pots does not show on their site, and googling does not find the pot number. I did check with the multimeter, roughly, they are Log, maybe 10% Audio, but ideally I need to mount one to a backing plate, draw out positions accurately, and then measure the taper. What bugs me, is that the normal pin-outs (left = in, centre = out/wipre, right = ground) as viewed from bottom side, does not make sense in terms of resistance compared to CTS diagrams. Never mind, wired up with clockwise = full volume, counter clockwise less volume. The last bit of the travel to maximum volume is rather drastic in volume response. Should work for players who need fast volume "swells". Could be handy when doing a quick solo in a song. Or driving the amp from "music" to "noise". It being late at night, and feeling brave (with no liquid anti-stressant within reach), I removed the old, small 100K pots. The Tone pot fits with no hassles, but I had to "slot" the hole for the larger diameter Volume pot, to allow clearance from the plug and wires. Not what I like to do, but no options here. I wired up everything as standard, but with a new 0.01microFarad tone capacitor. Sounds did emanate from the amp. But the tone control was kind of, well, weak. Bright sounds went to slightly less bright sounds. Not enough. Before starting to fit a bigger capacitor the next morning, I verified that the wiring is as internet sources for Tone Pots show. It is not, refer to the diagrams in the previous posts. I re-wired it to the "conventional" (?) layout, with the input from Volume pot on wiper (lug "2"), capacitor on lug "3" (bottom view), connected to ground, lug "1" open. I had good control now. Confidence at a high (and thinking ahead to a celebratory drink..), I made up a new Treble Bleed thingie, using the "Kinman" layout, with a 120K 1/4 Watt resistor and 0.001 microFarad capacitor. (The values he lists are not standard values.) Works OK. I shall play for a while to hear if I like it in the longer term - I have some picoFarad range capacitors if required, but, still, no stash of resistors to play around with. Ideally I should find said stash, and compare all the styles of treble bleed wiring. The picture shows it all. I leave the leads long on purpose, I would like to be able to re-use the components in future, if needed, and cutting the legs too short sort of makes that a remote possibility. Ah, caught out? No, the 1/4 Watt treble bleed resistor is in that long black heat shrink sleeve. Apologies for the koki-pen on the Tone pot, that was the marks I put there when I first measured the taper and decided where what goes. I was wrong, and I re-marked. You are, of course, correct: I should clean it off.